A young Nigerian man who travelled abroad for greener pastures, has been apprehended by the Indian Police operatives for engaging in illegal activities. The CIA staff in Kharar, India on Wednesday, arrested a Nigerian national identified as Nasa Ulagba, near Shivjot Enclave and seized half a kg of heroin from his possession. According to the Police, the value of the heroin in the international market is estimated to be Rs 2.5 crore. ASI Deepak Singh was patrolling near Shivjot Enclave when he noticed a Nigerian national coming out of the park. ''When he saw the police, he tried to escape from the spot. The police became suspicious and caught hold of him. On enquiry, he told the police his name and said he was staying in Tamil Nadu and had come here." 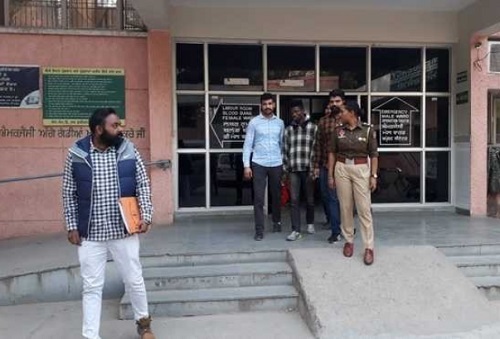 The Police called Kharar DSP Deep Kamal Singh to the spot and during his search, half a kg of heroin and a computerised weighing machine were recovered from him. He was arrested and a case under the NDPS Act registered against him. During interrogation, he confessed that he used to bring heroin from Delhi and sell it to students in the Kharar area.